People in New Mexico are gearing up for the fight of their lives – and whether they win could affect the safety of communities throughout the country, including yours. Local officials of Eddy and Lea counties in New Mexico have teamed up with a corporation called Holtec to propose a massive junkyard for nuclear waste. Holtec has applied for a license to build the site, where up to 100,000 metric tons of the most radioactive garbage on the planet would be stored in shallow silos. For how long? Holtec says maybe 100 years, but maybe … forever? This is a classic case of the nuclear industry trying to profit off an already bad solution by making it worse. It’s no accident that Holtec’s proposed site is only about 40 miles from another nuclear junkyard proposed by Waste Control Specialists (WCS) in Andrews County, Texas. Why here? The obvious reason is environmental racism: Eddy, Lea, and Andrews counties are all rural communities with a 44-52% Latinx population. For decades, this little corner of America has been treated as if it were a National Sacrifice Zone for radioactive and hazardous waste. The people of southeast New Mexico and West Texas have already been saddled with more than their share of radioactive and toxic hazards. They are being targeted for the most dangerous and long-lived industrial waste in the world, because of the color of their skin, their ethnic and linguistic heritages, and the fact that they’re far from mass media outlets that could bring the national attention the situation deserves. And they’re sick of it. The rest of the country needs to join them. If the Holtec-Eddy/Lea waste dump opens, thousands of communities throughout the country will be exposed to radiation and the risk of nuclear accidents. The shipment routes literally go through people’s backyards, right by schools and parks, next to rivers and farms, and through the downtowns of major cities. And, as we saw with the Baltimore train tunnel fire, an accident involving a nuclear waste shipment could be devastating, exposing first-responders and local residents to radiation, contaminating the area, and costing billions to clean up. People across the country spoke out this week when NRC held a hearing in Washington, DC. And don’t worry if you missed that – NRC is accepting comments from the public until May 19, so stay tuned to www.nirs.org. 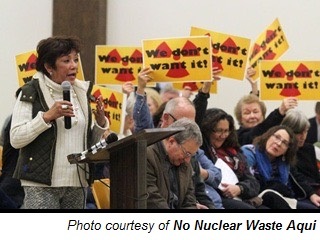 Environmental racism is reason enough to say no to the false solution of the Holtec and WCS nuclear junkyards. But the fact that thousands of communities across the country would be at risk from shipping the waste there means we are all in the same boat with communities in New Mexico and West Texas. That’s why NIRS has launched the Don’t Waste America campaign – to alert people throughout the US to the dangers these false solutions to nuclear waste pose to the whole country. If we don’t get active today, we could be radioactive tomorrow. So please tell NRC you don’t want your community endangered with nuclear waste shipments just to dump them on the people of New Mexico. And please support the Don’t Waste America campaign. We need your help to get the word out, stop nuclear waste dumps, and get the country on track with real solutions to the nuclear waste crisis.